Scroll down to see the most affordable environmental science degrees, as well as info on the different types of environmental science degrees and environmental science program accreditation. Linking study of natural sciences with a foundation in social sciences, public policy and economics, the Bachelor of Arts in Environmental Sciences at the University of California-Irvine prepares students to recognize the impact of humans on the environment. Students can concentrate their studies in a number of areas, such as water quality, climatology and resource management. The UCI School of Engineering offers Bachelor's, Master's and Doctoral degrees in Environmental Health Engineering in cooperation with the Department of Earth System Science. Ph.D.s are awarded in Environmental Studies, Environmental Health Engineering. The School of Medicine offers Masters and Doctorate degrees in Environmental Health Sciences. Scholarships include the Maria Rebecca and Maureen Bellettini Award ($1,000 to $1,500) and the Robert Doedens Undergraduate Achievement Award ($500). Offering a Bachelor of Science in Environmental Science, the University of Minnesota-Duluth focuses on science and mathematics to analyze environmental issues. Core courses focus on science and management of environmental systems, nonrenewable resources, renewable resources, pollution and technology and environmental assessment. As part of the College of Science and Engineering, the school offers opportunities to intern in the field and gain valuable hands-on experience. Scholarships in the college include the UMD William G. Emery Family Scholarship, UMD Philemon and Baucis Scholarship, UMD Dr. Ione Thompson Goodman Memorial Scholarship and UMD William G. Emery Family Scholarship. The Environmental Programs in Geosciences at Texas A&M University-College Station build on the College of Geoscience departments of atmospheric science, geography, geology and geophysics and oceanography, with a Bachelor of Science in Environmental Geosciences and a Bachelor of Science in Environmental Studies offered. While both degrees have a common academic core, the Environmental Studies curriculum incorporates information on environmental policy and social sciences. The Environmental Geosciences degree, on the other hand, is focused on fieldwork and laboratory research. Both encourage students to seek for-credit internships in their chosen field. Scholarships offered by the college include the Murry D. Page Scholarship, Travis Parker Scholarship and Kay and Winston G. Sexton Scholarship. Students may earn a Bachelor of Arts in Environmental Studies or a Bachelor of Science in Environmental Science, a Master of Science in Environmental Engineering and Ph.D. in Environmental Engineering from the University of North Carolina-Chapel Hill. The UNC Institute for the Environment helps to direct the curriculum of the various programs, housed in multiple colleges across the campus, and provides research, education and engagement opportunities for students. Undergraduates have the chance to take part in original research through Capstone Research Projects. One priority is the environmental issues facing local communities, and the Environmental Resource Program helps connect communities with UNC faculty and staff. Scholarship opportunities include the Pate Scholars program and the Alan and Linda Rimer Endowed Scholarship. Students pursuing a Bachelor of Science in Environmental Science at the University of California-Los Angeles can concentrate in one of eight associated areas in conjunction with other departments, such as environmental health or atmospheric and oceanic sciences. A year-long practicum offers a series of lectures and collaborative environmental case study requiring original data collection and analysis. Continued study is offered through Masters and Doctorate programs in Environmental Science and Engineering. Students can also become active in the Education for Sustainable Living Program, a student-led organization promoting sustainability through lectures and research. The department offers the Glickfeld Family Scholarship ($1,000) and the Greenspan Family Scholarship ($1,000). A little over an hour's drive from Joshua Tree National Park, UC Riverside is an enviable destination for Environmental Science majors. The department tries to make the cost attractive too, with undergrads eligible for the Stolzy-Letey Environmental Sciences Scholarship, the ENSC Undergraduate Travel to Professional Meetings Award, and the ENSC Undergraduate Research Award. Students in the MS and PhD in Environmental Sciences programs receive support as well, through sources such as the Albert Marsh Environmental Sciences Scholarship and the Frank T. Bingham Memorial Fellowship in Soil Science. Although the general rule is that all grad students receive funding, the source is important. Fellowships typically cover full tuition, fees and a stipend; teaching and research assistantships cover a portion thereof. Students in the Environmental Sciences, Policy and Management program of the University of Minnesota-Twin Cities can earn a Bachelor's degree with a concentration in conservation and resource management, corporate environmental management, environmental education and communication, environmental science or policy, planning, law and society. Believing that environmental studies is a global effort, the school encourages students to take part in international study opportunities. The Learning Abroad in ESPM offers programs specifically for environmental studies students with durations of a few weeks to a full year. There are also undergraduate research opportunities, with some funding offered. Scholarship opportunities include Recruitment Scholarship ($1,000) and ESPM Service Scholarship ($1,500). The Department of Environmental Science, Policy & Management at UC Berkeley offers a Bachelor of Science in Environmental Science degree with concentrations in biological science, physical science, and social science. Students are required to complete a year-long senior research project in order to graduate. The department also offers a Doctor of Philosophy (PhD) in Environmental Science degree that allows students to focus in one of three areas: ecosystem sciences, organisms & environment, and society & environment. Further specializations within each field is possible and students can specialize in areas such as microbial community ecology, ecosystem function, international forest management, or biogeochemistry. The Sponsored Projects for Undergraduate Research (SPUR) program provides financial assistance to students engaged in research projects with faculty members. The Department of Environmental Science and Policy offers two majors - Environmental Policy Analysis and Planning (EPAP) and Environmental Science and Management (ESM). Students pursuing the EPAP major can receive specialized training in one of the following tracks: city & regional planning, climate change policy, conservation management, energy & transportation policy, environmental policy & politics, water management, and integrative policy. The ESM major has six tracks: climate change & air quality, ecology, biodiversity & conservation, geospatial information science, natural resource management, soils & biogeochemistry, and watershed science. As part of the College of Agricultural and Environmental Sciences, ESM and EPAP majors can apply for a number of scholarships, including the Peter J. Shields Scholarship and the Arlo D. Gustafson Scholarship. Westfield State boasts that it has one of the largest Environmental Science programs in the U.S. In fact, it's not just a major, but a full-fledged department, large enough to support its own student organization: the Environmental Planning Club. Majors can benefit from the school's property along the Westfield River in the Berkshires, where they might carry out some of their projects. For instance, the Water Resource Management course takes canoe trips there. The Marine Biology class gets further afield, with an annual 3-day pilgrimage to Maine's shoreline. Seniors have landed capstone internships with national groups such as the Nature Conservancy and the National Park Service as well as local organizations, including the Pioneer Valley Planning Commission. At SUNY Oneonta, the environmental studies major is an interdisciplinary program housed in the Department of Geography and Environmental Sustainability. To earn the Bachelor of Science in Environmental Sustainability, students complete classes in biology, geography, geology, and environmental social sciences plus courses in environmental sustainability. All majors must take at least three credits in study abroad, internship, research with a faculty member, or service learning. Recent examples include a field trip along the Hudson River or a trip to Guatemala to help local residents improve water quality. Environmental studies majors are eligible for several named scholarships, such as the Dr. John G. New Scholarship, based on academic achievement and environmental advocacy. At Appalachian State University, western North Carolina is a laboratory as Environmental Science majors examine issues such as sustainable development in mountainous terrain; the effects of agriculture and recreation on resources such as water; the ecology of mountain forests; and stream systems. Students who earn a Bachelors in Environmental Sciences take an interdisciplinary approach, studying math, geology, biology, chemistry, physics, astronomy, geography, hydrology and meteorology. During their senior year, students incorporate what they have learned from these different disciplines into a capstone project that involves researching a topic of their choice. The college offers environmental science field trips around the U.S. and abroad. Students also have the chance to work with top researchers in the field. Stewardship of a variety of natural resources and ecosystems is the focus of the Bachelor of Science offered by the Department of Environmental Conservation of the University of Massachusetts-Amherst, while the College of Engineering offers a Master of Science and Ph.D. in Environmental and Water Resources Engineering. The Bachelor of Science program includes a core curriculum of natural science, mathematics and environmental studies supplemented with seminars and field experiences. Students can specialize in areas such as environmental policy and land use or biology. Graduate students work on current and future challenges in resource management. The school maintains outreach programs with several research centers. Scholarships include the Natural History Collections ($300 to $4,000). St. Cloud offers a Bachelors in Environmental Studies and a Bachelors in Environmental Science, giving students two choices for how they want to prepare for an environment-related career. Environmental science is a science-based interdisciplinary program for students hoping to do research or continue on to grad school. The environmental studies program is also interdepartmental, with students selecting relevant classes from both the natural and social sciences. With either major, students develop job skills through lab assignments, field research and internships. St. Cloud has several specialized resources, including on-campus centers for environmental modeling, environmental instrumentation and environmental soils. Environmental faculty members are researching topics such as watershed management and restoration of wild rice beds in central Minnesota. The School of Forest Resources and Environmental Science at Michigan Technological University is rated among the top ten in the country (USA Today) for studying Natural Resources, and offers degrees in Applied Ecology and Environmental Science, among other subjects. In addition, Michigan Tech awards more degrees in environmental engineering than any other school in the United States. Undergrads in the program are involved in water quality research projects and can earn their Masters in Environmental Engineering quickly through the accelerated masters program. Michigan Tech students can also gain valuable work experience through the co-op program and internships or help with faculty research. Grad students can choose a specialty such as water resources, air quality engineering or infrastructure when pursuing a Masters or Ph.D in Environmental Engineering. Sustainability is a core element of all graduate programs in environmental engineering. Resources at Michigan Tech include a research vessel that allows students to use Lake Superior as a freshwater laboratory. The College of Liberal Arts and the College of Natural Sciences and Mathematics jointly offer the Environmental Science and Policy programs at CSU Long Beach. Bachelor of Arts and Bachelor of Science degrees are both available and a minor in the field is offered as well. Students take courses that cover topics such as environmental law and policy, climate action and sustainability, and California ecosystems. BA students are encouraged to double major or minor in a related discipline such as anthropology, geography, or political science. BS students typically double major or minor in fields such as biology, chemistry, earth science, ecology, and geology. Qualified students can apply for the Southern California Edison Scholarship, which gives out two $2,350 awards each year. The Bachelor of Science in Environmental Studies at Castleton University is housed in the Natural Sciences Department and includes elements from geology, chemistry, and biology. The faculty takes advantage of the local environment by having lab students study ecosystems across Vermont. Students can also take travel courses to study environments as diverse as the Mojave Desert and Iceland. To hone their skills, students can take part in internships or work with department faculty on research projects. Some faculty research is funded by grants that allow students to be paid a stipend for research work performed over the summer. Students involved in research often present their work at regional or national conferences. The Environmental Studies program at UC Santa Barbara offers Bachelor of Arts and Bachelor of Science degrees in environmental studies. Both programs provide students with ample opportunities to study a wide range of environmental issues, including climate systems, energy technologies, environmental law and policy, urban and regional planning, and environmental impact analysis. UC Santa Barbara doctoral students can now add an Interdepartmental PhD Emphasis in Environment and Society to their program. At the current time, 16 campus units now offer this emphasis to their PhD candidates, including anthropology, education, global international studies, history, and psychology. Full-time students can apply for the Tom Rogers Scholarship for Environmental Studies ($2,500 to $5,000) and the Barker Scholarship for Environmental Internships ($1,000 to $1,500). Environmental Science is a rigorous program at Iowa State, with students learning physical, chemical and biological sciences and integrating those disciplines as they study aspects of the natural world. The university grants Bachelors, Masters, and Ph.Ds in Environmental Science. Students may also pursue a Bachelors in Environmental Studies, which concentrates on the relationship between humans and the natural environment. As a research university, Iowa State offers many opportunities for undergrads to help in faculty research to earn money or credit. Many graduate students receive assistantships or fellowships. Iowa State has many student organizations that focus on sustainability, the environment or water quality. The Skunk River Navy, for example, helps to maintain the Skunk River and its tributaries. At SUNY College of Environmental Science and Forestry, students who want to study environmental science have a wealth of choices at the undergraduate and graduate level. Along with degrees in environmental science, options include environmental education, environmental resource engineering, and conservation biology. SUNY-ESF is included in the new Excelsior Scholarship program for New York residents, who can get up to $5,500 annually for tuition. Other scholarship opportunities include up to $8,000 for National Merit or National Hispanic Scholarship finalists or semifinalists, and scholarships for members of the Haudenosaunee nations. ESF has a strong tradition of service learning, where students take part in community serve programs. Examples include the annual Saturday of Service and alternative spring break service trips. The University of Florida Department of Environmental Engineering Sciences offers a Bachelor of Science, Master of Science, Master of Engineering and Ph.D. in Environmental Engineering Sciences. Graduate courses allow for specialization in seven areas. The Bachelor's of Science is accredited by the Engineering Accreditation Commission of ABET, while all programs of the department are accredited through the Southern Association of Colleges and Schools. The College of Agriculture and Life Science offers a Bachelor's in Environmental Science, preparing students for careers in environmental consulting, water management and government and non-government environmental agencies. Scholarships include the Willes Scholarship ($500), Florida Environmental ($500) and HDR Engineering ($1,000). Environmental science is offered as an area of concentration within the science and letters curriculum at UIUC's College of Liberal Arts and Sciences. Coursework for this concentration area includes topics such as the history of the earth system, climate and global change, environmental geology, and earth materials and the environment. The Bachelor of Science in Chemistry degree gives students the option of selecting environmental chemistry as their area of concentration. Students who complete the program are eligible for certification in the field of environmental chemistry given by the American Chemical Society (ACS). The curriculum for this program covers a wide range of subject matter including fundamental organic chemistry, solid state structural analysis, instrumental characterization, green chemistry, and environmental toxicology and health. The Department of Earth and Environmental Sciences at the University of Iowa hosts a bevy of degrees, including a BA/BS in Geoscience and a BA/BS in Environmental Sciences. The Joint BA/MAT with Science Education program qualifies those in the latter for teaching positions with just five years of overall study. At the graduate level, students pursuing an MS in Geoscience, MA in Science Education or PhD in Geoscience can apply for teaching and research assistantships with the department. PhD-seekers can apply for the Iowa Fellowship, which pays $17,500 annually plus provides full tuition for four years. Students who major in environmental science at Geneva College take at least four courses at Au Sable Institute of Environmental Studies, a Christian teaching center that provides hands-on learning and classes in theory and ethics. Au Sable classes are offered in Michigan, Washington, Costa Rica, and India. Geneva's environmental studies program is housed in the Biology Department, and students take biology courses as well as courses in chemistry, physics, and statistics. For additional hands-on experiences, students can take part in the Creation Stewardship Club and may be eligible for fellowships through Au Sable lnstitute. Geneva ranked No. 3 in Best Value Regional Colleges in the North in the 2017 U.S. News & World Report rankings. Michigan State offers a wide range of environmental degrees. The College of Natural Science grants undergrad degrees in environmental biology and a Masters in Environmental Policy and in Environmental Toxicology. Students in the College of Agriculture and Natural Resources can major in environmental economics and management or in environmental studies and sustainability. The College of Engineering grants Bachelor, Master and Ph.D degrees in Environmental Engineering. Many scholarships are available to students in the various environmental programs at Michigan State, such as the Rory M. Shaw Memorial Endowed Scholarship/Fellowship Fund for students in the Department of Civil and Environmental Engineering. Michigan State provides many study abroad opportunities for environmental students, with programs in Asia, South America, Europe and Africa. Minnesota State University offers a Bachelor of Science degree in environmental sciences through the College of Science, Engineering, and Technology (CSET). Students are required to complete 28-32 credits in the major that include courses such as global change biology, environmental pollution and control, general ecology, analysis of pollutants, and environmental regulations. A Master of Science in Environmental Studies degree is also available. Students can complete the program by writing a thesis or choosing the alternate plan paper option. The thesis plan requires 30 graduate-level credits, while the alternate plan paper option requires 34 graduate-level credits. Academically qualified undergraduate students who have completed at least two full semesters in the program may be considered for the CSET Scholarship ($500 to $1,000). At CUNY Queens College, students interested in becoming an environmental researcher or consultant can earn a BS or BA in Environmental Science. The interdisciplinary program includes a rigorous set of classes from departments including math, biology, physics, chemistry and geology. The BA in Environmental Studies is also an interdisciplinary program, but it focuses more on the social science and public policy side of environmental issues. Queens College also offers a Master of Arts in Geological and Environmental Sciences, and a Master of Science in Applied Environmental Geosciences. The School of Earth and Environmental Sciences was created in 1996 so that Queens College could hire a truly interdisciplinary faculty focusing on the environment. The Bachelor of Arts in Environmental Studies program at UC Santa Cruz offers the following focus areas: agroecology and sustainable agriculture, conservation science and natural history, environmental education and sustainability, environmental policy, and political economy. Students have the option of pursuing combined degrees in the field of biology, economics, and earth sciences. The university started offering a concentration in agroecology and sustainable food systems for all undergraduate programs in the fall of 2015. The Doctor of Philosophy program provides doctoral candidates with opportunities to study topics such as global change ecology, environmental policy, and conservation biology. The university does not offer a terminal degree on the master's level. Undergraduates can apply for the James Stuart Chanley Scholarship in Environmental Studies ($1,000). The University of Nebraska-Omaha Environmental Studies Department offers a Bachelor of Science in Environmental Studies with concentrations in analytical sciences, earth sciences, geography and planning, and life sciences. The interdisciplinary program combines study of physical science with courses in economics, political science, sociology, law and ethics. Students can deepen their understanding of the subject through internships, service learning, student organizations and international study. The college also offers outreach programs, such as Prairie Preserves, numerous camps for youth and ongoing research and consulting programs. The department offers the Dr. Barbara Hayhome Memorial Undergraduate Scholarship ($1,400), David Chesneau Memorial Scholarship ($800) and Bertrand and Marian Othmer Schultz Collegiate Scholarship ($3,000). The California State University at Fullerton offers a Master of Science degree in environmental studies with two tracks - environment and society and environmental sciences and technology. Applicants who intend to pursue the environment and society track must have completed one undergraduate course in ecology and one course in quantitative methods. The environmental sciences and technology track considers students who have completed nine upper division units in natural and/or physical sciences, mathematics, and/or engineering. The curriculum includes core courses and electives that cover relevant areas such as environmental research and analysis, environmental problems, and environmental evaluation and protection. Students can opt to write a thesis, complete a project, or take a comprehensive exam in order to graduate from the program. City College of New York students interested in environmental science can earn a degree through the Earth System Science & Environmental Engineering (ESE) Department. The Bachelor of Science in Environmental Earth System Science offers three tracks: Environmental Chemistry, Hydrology and Climate, or Ecosystems and Environmental Science. The Bachelor of Engineering in ESE also has three tracks: Energy and Environment, Remote Sensing and Environment, or Water Resources and Environment. The department also offers a Master of Science or Professional Science Master in ESE. The programs include classes in engineering and science and allow students flexibility by offering a large number of electives. Faculty members are involved in government- and industry-sponsored research in areas including air pollution and water quality. The State University of New York-Plattsburgh offers a Bachelor of Arts in Environmental Studies and Bachelor of Arts or Bachelor of Science in Environmental Science. The Environmental Studies program incorporates study of activism, ethics and sustainability while the Environmental Science programs focus on scientific study of the environment. SUNY-Plattsburgh offers a chance to study at the Applied Environmental Science Program at Miner Institute for an off-campus, residential program that focuses on hands-on laboratory experience with courses in wildlife ecology, hydrogeology, water quality, soil science and agriculture, with additional research facilities at Altona Flat Rock and the Lake Champlain Research Institute. Scholarships include the Casella Waste Systems, Inc. Scholarship ($1,500), Hudson Endowment Scholarship ($750) and James A. FitzPatrick Scholarship ($1,000). The University of North Texas offers several graduate degrees in environmental science: a Master of Science in Environmental Science, a Professional Science Master's Degree in Environmental Science, and a Ph.D. in Environmental Science. Students in the environmental science program will take courses in chemistry, biology, ecology, anthropology, geography, geology, and philosophy. The environmental science program at UNT is an interdisciplinary program, which focuses on the main environmental issues that face the world today. The goal of the research within the program is to create a comprehensive understanding of the critical issues related to our environment. Fresno State offers a Bachelor of Science in Environmental Sciences degree through the College of Science and Mathematics. The program utilizes an interdisciplinary approach with an emphasis on biology, chemistry, and geology. The curriculum includes courses that cover a wide range of topics such as natural disasters and earth resources, atmospheric science, geomorphology, environmental GIS and engineering geology. The Patagonia Scholarship provides two scholarships each year to qualified incoming freshmen majoring in environmental sciences. The scholarship covers full tuition, room and board, and a book stipend. The Downing Science Scholarship ($2,000) is awarded to a senior student in each department of the College of Science and Mathematics. The award is based on the student's academic and extra-curricular achievement during the junior year. The School of Geosciences at USF's College of Arts and Sciences offers a Bachelor of Science in Environmental Science and Policy program. Students admitted to this program have the option of concentrating in environmental science or in environmental policy. There is also a Master of Science in Environmental Science and Policy degree available. This program offers the following tracks: ecology, environmental policy and management, geology, hydrogeology, hazards assessment and mitigation, urban environment, and water quality and policy. MS students can choose either the thesis or non-thesis option. The school offers a Doctor of Philosophy in Environmental Science and Policy degree as well. Qualified MS and PhD candidates are considered for teaching and research assistantships, which cover tuition and provide a stipend. Environmental science examines what happens when the environment and humans collide. Pollution, global warming, conservation – this subject deals with it all. It’s a growing field. According to the BLS, employment of environmental scientists and specialists is projected to increase 15% from 2012 to 2022. Departments are springing up left and right and universities are falling over themselves to offer programs. Others are joining sustainability organizations, such as the International Sustainable Campus Network, in an effort to clean up their own operations. 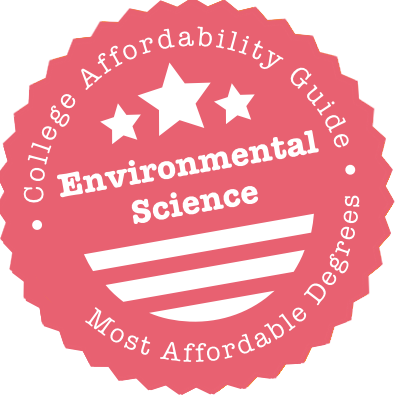 That’s why we decided to create this guide to affordable environmental science degrees. For all the time and money you’re putting into your education, we believe you deserve a solid end result. In the first section, we outline what an environmental scientist does, what kinds of disciplines exist (e.g. engineering, science, toxicology) and the important difference between “studies” and “science”. In the second and third sections, we dive into common degrees and important accreditations. Environmental scientists study the thorny problems created by human interaction with the environment – problems like global warming, water pollution, deforestation and the loss of precious ecosystems. In response to these challenges, many environmental scientists also search for creative solutions. They may be involved in sustainable agriculture, waste management, environmental health initiatives, the reduction of industrial pollution, wildlife protection and conservation efforts. Environmental science is an interdisciplinary field that employs many branches of science (e.g. biology, ecology, geology, oceanology, physics, soil science, etc.) to study the impact of humans on the environment. It is founded on principles of scientific inquiry. Environmental health engineering examines the influence of the environment (biological, physical and social) on public health. Topics of importance include waste disposal, air pollution, clean water, sustainability and environmental law. Civil environmental engineers might design water treatment plants or recycling facilities. Chemical environmental engineers might work on ozone depletion, separation technologies or solutions to acid rain. Environmental studies is a broad, interdisciplinary field that investigates the intersection of humans, technology and the environment. In addition to environmental science, it tackles related subjects like urban planning, environmental legislation, economic policy and natural resource management. Which chemicals pose a risk to human health? What pathways do toxins take in the environment? How can ecosystems be protected? Investigating education options? You’ll see some universities offering degrees in environmental studies, others in environmental science. Programs in Environmental Studies usually involve fewer science courses and more liberal arts subjects (e.g. law, economics). Programs in Environmental Science dig deeper into science (physics, biology and organic chemistry), advanced statistics, engineering and technology. Before you decide on a path, we recommend you research your “dream jobs” to see which degree is preferred. Some employers may specifically want an environmental science qualification. An associate’s degree is a two-year program designed to introduce you to the field of environmental science. Courses often cover science (e.g. biology, chemistry), math and environmental studies (e.g. resource management). For more on the difference between degrees, see our breakdown of Environmental Science Disciplines. Like many students, you might use your associate’s degree as the first step towards a bachelor’s. Or you could look into becoming a research technician, laboratory assistant or animal care specialist. Note: Thinking of doing an online associate’s degree? Check that your credits will be transferable to a bachelor’s degree. A bachelor’s degree is a four-year undergraduate program that’s intended to give you a firm grounding in environmental science. Your first two years will be spent on general education and science courses. In your junior and senior years, you’ll be able to concentrate on environmental electives and field research. A bachelor’s degree can be used for “starter” positions (e.g. science teacher, sustainability consultant, environmental policy analyst, lobbyist, soil conservationist, etc.) or as a basis for graduate work. To gain more responsibility and freedom in the field, many environmental scientists opt for a master’s degree. A master’s degree is a challenging 2-3 year program that will deepen your understanding of environmental science. The degree usually includes field-specific courses (e.g. environmental monitoring) and an independent research project (e.g. thesis). Want to super-specialize? You could also consider a master’s degree in a specific subject like wetland management, environmental pollution control, ocean studies, etc. Whatever topic you choose, an MS will open the door to higher pay, management positions and a host of career options. A PhD is a rigorous 4-7 year program recognized as the highest level of academic achievement. Instead of traditional courses, you may be required to attend seminars or teach undergraduate classes. You will also be expected to produce a piece of original research. Many holders of PhDs in Environmental Science teach in universities or work in research labs. Others go the route of becoming independent consultants or entrepreneurs. A certificate in environmental science is a short program (6 months – 1 year) intended to hone certain skills. Certificates cover a dizzying range of subjects – from environmental policy to hydrology to renewable energy. Undergraduate Certificate: Allows students to explore a field of interest with fewer course requirements than a major. Graduate Certificate: Popular with environmental professionals looking to plug skill gaps or people seeking a career change. Some schools allow you to apply certificate credits towards a graduate degree. Over the past few years, online environmental science certificates have become very popular. Note: Earning an academic certificate is not the same as gaining professional certification (e.g. CES). Certification bodies have very specific academic and work requirements. Above all, we recommend your school have regional accreditation. This is an independent accreditation granted to non-profit colleges and universities by one of six regional organizations (e.g. Middle States Commission on Higher Education). These concerns can be especially important if you’re thinking of obtaining an online degree. ABET accredits programs in applied sciences, computing and engineering. Considering a degree in environmental engineering? ABET accreditation is a recognized sign of quality. Learn more about ABET’s Program Criteria For Accrediting Applied Science Programs. EHAC accredits programs in environmental health engineering. It’s not necessary for these degrees to have EHAC accreditation, but it’s an additional mark of excellence.